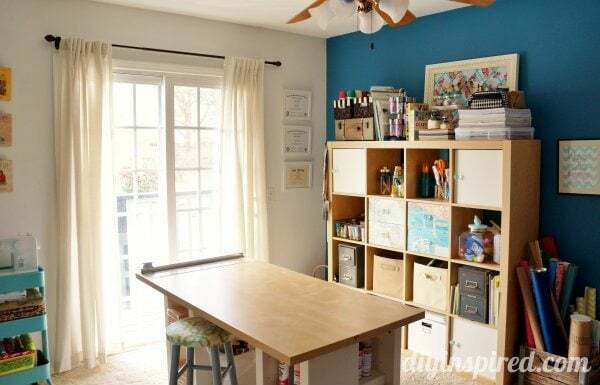 I have shared my sanctuary, I mean my craft room before however, I have done some fun inspiring updates, upcycles, and repurposing ideas since then and I wanted to share them today. PLUS I am also a part of a fun series of Craft Room Tours hosted by The Country Chic Cottage! So, I hope you enjoy my DIY Inspired Craft Room Tour! I am lucky enough to have dedicated a bedroom into my craft room and office. This is the view when you first walk in the door. 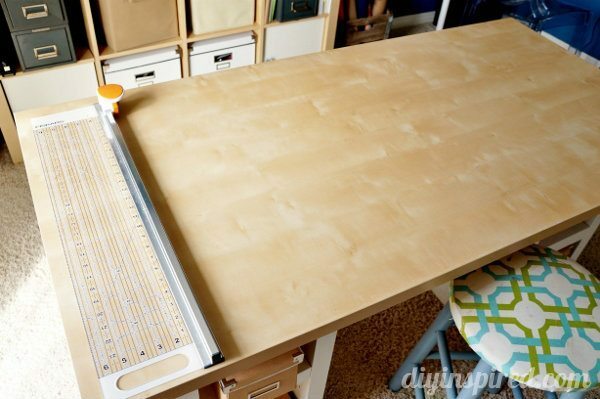 I have a large table in the center of the room that is perfect for so many projects. I bought the table top and bases at IKEA. It’s a little beat up from paint and glue and other things, but the great thing is that IKEA is so affordable, that I can easily just replace the top if I need to. This is the base of the craft table. It is so handy for extra storage. The table has eight shelves all together. The stool pictured here are old wooden barstools that I upholstered and painted. In case you missed it, here is my upholstered bar stools post. I also purchased this shelving unit from IKEA. It’s fantastic! 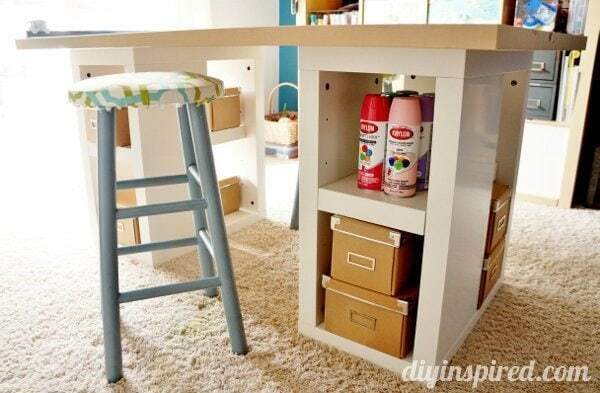 You can customize it with drawers and doors. I used decoupage on my drawers and made recycled map drawers. This unit houses several craft storage ideas I have done including 1) stenciled thrift store craft jar, 2) repurposed spice rack, 3) thrift store pedestal trays, 4) recycled jar craft storage, 5) dollar store craft storage, 6) a magnet board filled with repurposed magnet craft storage, and lastly my 7) DIY organization ribbon board. 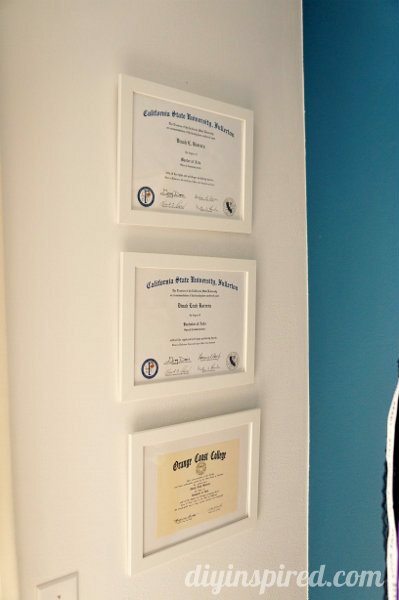 To the left of it I proudly display my degrees I worked so hard on! 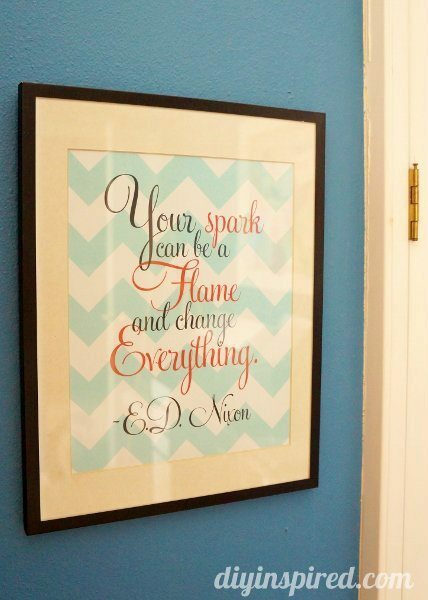 To the right of it I hung this inspiring print. 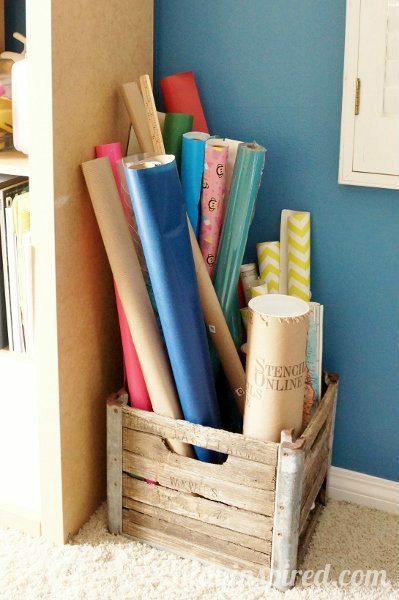 Underneath that print is an old milk carton I used to hold wrapping paper, yard sticks, and stencils. It’s perfect because it has the metal slots that used to hold milk bottles. Here is a shot of the other side of my craft room. 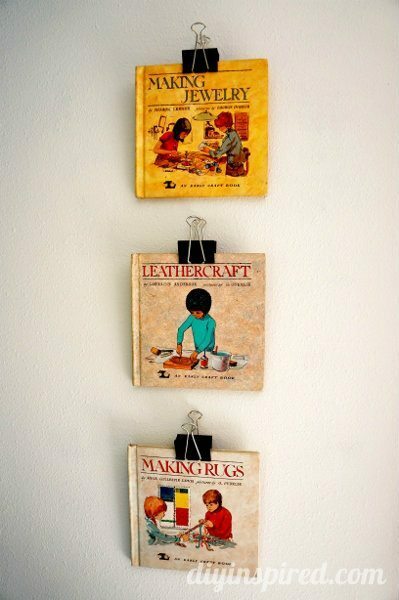 On this side, I hung some fun vintage craft books that my best friend gave me. I also just recently painted this wall from dark to light. 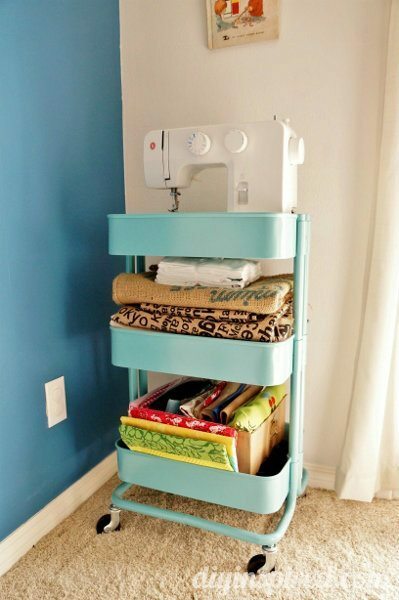 I also have a kitchen cart that I put my sewing machine, burlap, and fabric on. 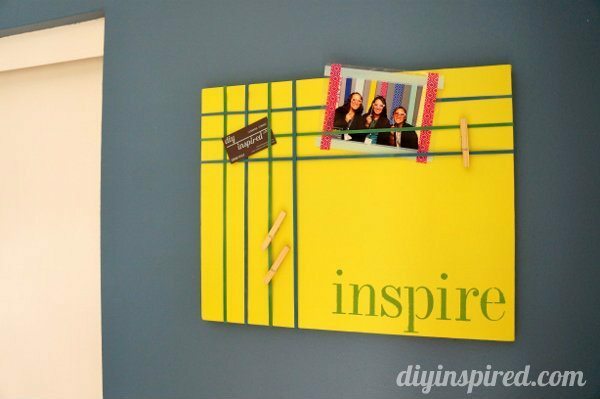 I also hung an inspiration board I made out of a paint canvas and giant rubber bands. Here’s another angle of the room. I have to admit there is another side not pictured with a desk with two monitors, my laptop, and two different printers, and my Silhouette CAMEO but it is JUST to messy to show! Ha! 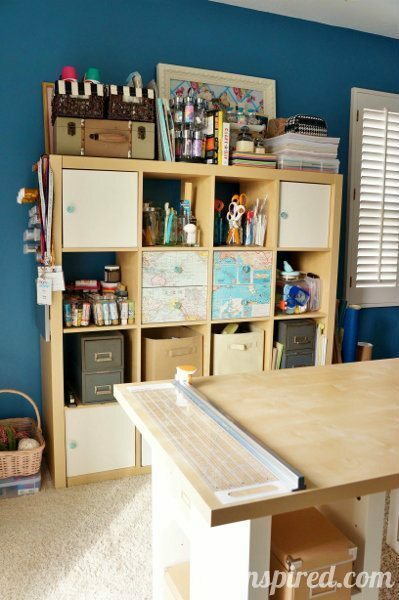 I hope you enjoyed the DIY Inspired Craft Room Tour! Be sure to check out Michelle’s tour over at Delicate Construction, and tomorrow, Kellie from Nest of Posies will share her creative space! You can also visit our Host, Angie from The Country Chic Cottage who will be showcasing all the Bloggers participating (over 30!!!) in all this crafty goodness! This is fabulous Dinah!! I need an Ikea like now!! Thanks for joining! 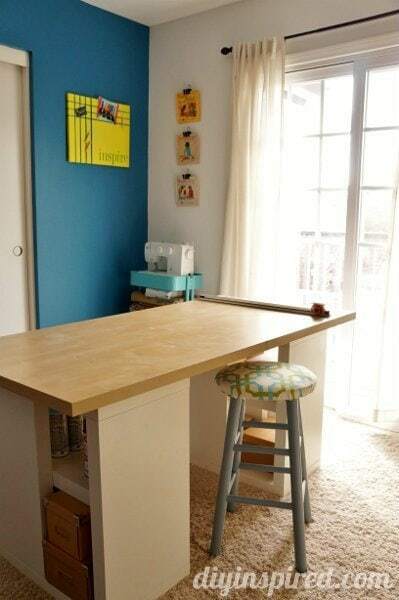 Great use of space, Dinah, as I’ve said before – Ikea is perfection! 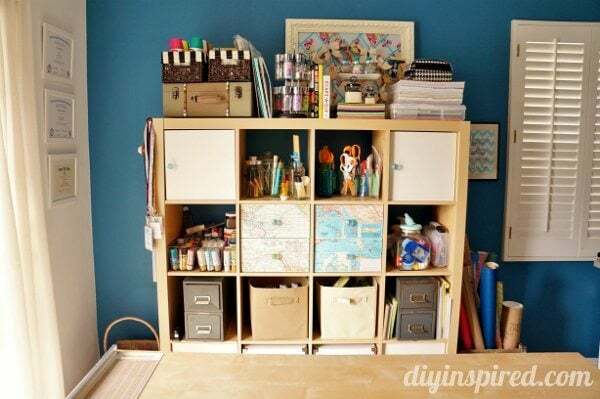 I notice the rolls of paper and other items out, is there a spot on one of your walls for some built in storage boxes? I think that would look real cool! Hi! I love your craft table. 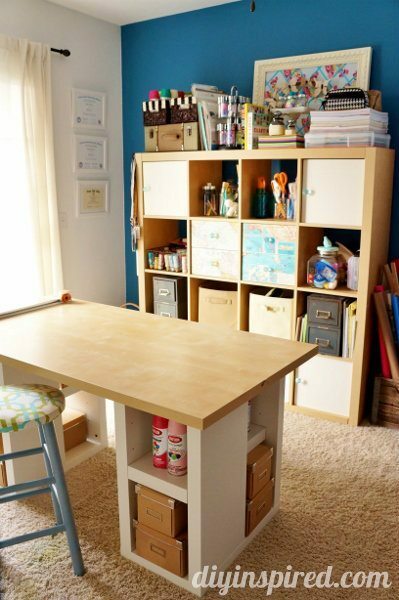 What are the storage/shelving units called that are underneath the desktop? I have searched IKEA’s website and can’t locate it 🙂 or are they another brand? I really like them. Thanks! Hi MK! Ack! I can’t find it online either. Next time I go, I’ll look to see if they still have it and let you know! Thanks Dinah! I found them, well found the name of them (VIKA Annefors table leg) but they’re no longer made 🙁 Guess I’m a few years behind! Thanks so much for the answer. I did find others at IKEA that will work – yay! Thank you again. Darn it! OK… I did see some nice alternatives when I was looking. Send me a pic of when your done! I’d love to see what you end up doing!